The 2008 Summer Olympic games will take place in Beijing, China, making it a fitting time to write about the Olympics. In preparation of the Olympic games, Beijing’s subway system had undergone a massive increase, more than doubling it’s previous size. Also, the Beijing Capital International Airport will get a new five-level emergency alert system for extreme weather and security threats. Whoa. The slogan for the 2008 Olympics is “One World, One Dream”, which calls upon the whole world to join in the Olympic spirit and build a better future for humanity. It was selected from over 210,000 entries submitted from all over the world. There has been some controversy over how China has been treating Tibet and this has spilled over into the Beijing Olympics. In fact, some supporters of Tibet have declared that they would boycott the 2008 Summer Olympics games in protest. Nevertheless, the games will carry on. Here are the sports to be contested at the Beijing games, with the number of events to be contested in each sport is indicated in parentheses. In anticipation of the upcoming Olympics, it is natural that some background on the games will be brought up and written about. So isn’t it only fitting that I write about it too? The Olympics originated in ancient Greece. It was held every fourth year, like the modern Olympics. But with a few twists. Women were not allowed to compete if they were married nor could they compete personally, but were allowed to enter equestrian events as the owner of a chariot team or an individual horse, and win that way. Oh, and the other thing? All the participants were naked. But fortunately (or unfortunately) the Olympics were abolished in the early Christian era, along with the naked-ness. The Olympics were brought back in 1850, in the modest town of Much Wenlock, Shropshire by Doctor William Penny Brookes. He believed the men of the town spent far too much time in the pub and came up with the modern Olympics to occupy their time. Though the Olympics hasn’t helped the modern day men who still spend far too much time in the pub. Doctor Brookes founded the National Olympics Foundation in 1865 and staged the first Olympics at London’s Crystal Palace. However, it was snubbed by the top sportsmen for lack of funding. The modern Olympics was revived in Athens, Greece by a French man called Pierre de Coubertin. Around that time, the world was starting to communicate and connect through telegraph and train. Also, the athletes from different countries were starting challenge each other. And so, de Coubertin thought it would be a good idea to get all the different countries to compete and that is why he revived the Olympics. The modern day Olympics were started again in 1896 in Athens, Greece, and they continued to be held every fourth year. However, they were not held during the World Wars 1 and 2. The Olympic Games was not without its fair share of drama. In the 1972 Munich games, 11 members of the Israeli team were taken hostage by a terrorist group called Black September. Five German snipers were chosen to rescue them, but they failed. All 11 hostages died, along with 1 German police officer. The 1972 Munich games came to be known as the Munich Massacre. There used to be two Olympics in the same year, the Summer Olympics and the Winter Olympics, both held separately. But in 1986, the IOC decided to reschedule the Summer and Winter Games by alternating between them every 2 years: each would still be held in four-year cycles, but two years apart from one another. The Lillehammer Games in 1994 were the first Winter Olympics to be held without the Summer Games in the same year; in a non-leap, even year. It has been decided that the 2010 Winter games will take place in Vancouver, British Columbia, Canada; the 2012 Summer games in London, United Kingdom; and the 2014 Winter games in Sochi, Russia. The opening ceremony of the Olympics in Beijing will be held in the Beijing National Stadium, and will begin at 8:00 pm CST (12:00 UTC) on 8 August 2008. It has been announced that Canada’s Celine Dion and Taiwan’s Jay Chou will both perform during the opening ceremony. On July 21, NBC announced that the Opening Ceremony would include performances by a cast of 15,000 and declared that it would be the most spectacular Olympics Opening Ceremony ever produced. When you hear China, you might think the Olympics; the Chinese food you had for dinner last night; your new pair of made-in-China flip-flops. With the 2008 Olympics set to begin in Beijing on August 8, China is being somewhat reborn, as China is one of the most Ancient civilizations of the world as well as one of the largest. In fact, written Chinese history dates back to 3,000 B.C. We know what went on in Ancient China because they had official historians who wrote down everything that happened. Being an official historian was dangerous, often they would get replaced frequently, but it was considered immoral to write down something other than the truth. We also know that another important job at the court was the official “Reminder”, whose purpose was to remind rulers to live more simply like the ancient heroes of the past, not to shirk their responsibilities, or criticise the government officials. Today, our “Reminder” are blogs and the internet, in general. The Chinese rulers, for the most part, managed their country gently and simply, allowing the lords of different states to rule as they liked. But then along came the ruler Ch’in Shi Huang, lord of one of the states. The Rise of Ch’in Shi Huang. Ch’in Shi Huang believed that good government was harsh government and that power was always right. In 221 B.C. he declared himself ruler of all China. Interestingly, Ch’in Shi Huang means “First Ch’in Sovereign Emperor” and that is how China got its name. Another thing you might think of when you hear China is The Great Wall. 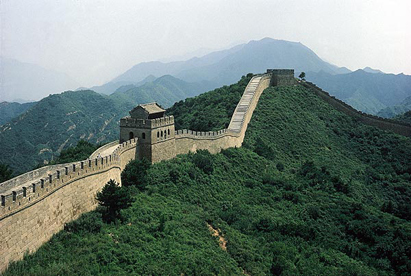 The Great Wall was one of Ch’in Shi Huang’s many building projects, with all of them aimed at uniting China. He used his enemies and their families as slaves to build the Great Wall. The working conditions were cruel and many died. Notice the watch towers? Those were there for Chinese soldiers to keep watch. History is mostly made up of power hungry people conquering other power hungry people and then figuring new ways to get their needs met. Which is why the Great Wall was built, its purpose was to protect and cocoon the empire from attacks from close warring tribes like the Huns and the Tartars. The Great Wall is still there today, and stands 1500 miles long and 20 feet high. Ch’in Shi Huang had a gigantic tomb built for him. Inside, it held an entire model army made out of terra cotta clay amounting to 7,500 soldiers. The rest of the army included clay chariots, horses and officers. Bows and arrows held by the terra cotta bowmen were actually set to shoot off should the tomb ever be robbed. The tomb also held model palaces and canals with mercury running through them, run by wheels, like a great river. The tomb was only just discovered in 1974 and parts of it are still being unearthed. After Ch’in Shi Huang died, the Ch’in Dynasty began a downward spiral, and the Han dynasty overthrew them. China was ruled by dynasties for thousands of years. Like monarchy, there is a king and when the king dies his heir – usually the eldest son – takes over. Unlike monarchy, however, different dynasties were not related, a dynasty would end if the family died out, or if a competing family was able to overthrow it and take over. That must be why they call it die-nasties (dynasties). The Han Dynasty believed in good government and established an educational system for making sure the smartest boys in China were brought up to become government officials, no matter what their background. The Battle of the Sexes. Or Something. 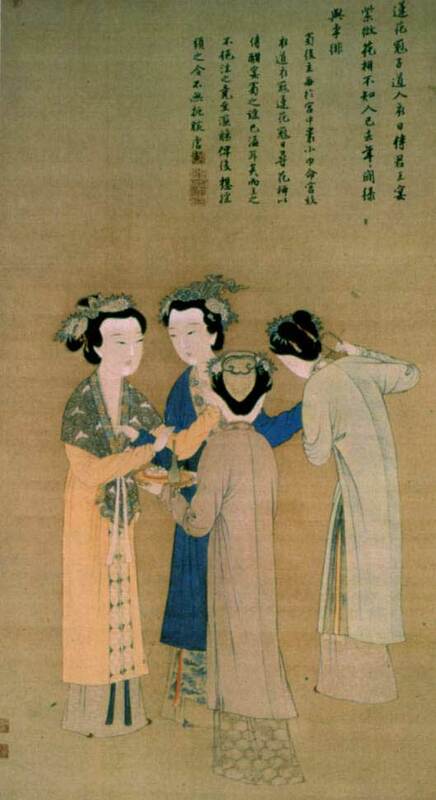 In Ancient China, and still some parts of the world today, females were treated as inferior to males. For example, a wife was never to address her husband by name and was to hand her husband things on a tray in order to avoid touching his hand. A wife’s duty was to serve her husband and parents-in-law and to take care of the children. A girl whose fiancé has died was still expected to take care of his parents, which, in my opinion, is not fair at all. Almost from birth, girls were taught to be subservient, and often baby girls slept on the floor to symbolize how inferior they were. Alright, we get it! However, there is a story from the second century B.C. which goes: Emperor Liu Ch’e was so taken by the gentle manners and humility of a slave girl that he made her his empress. Eventually, her brother became a general, and her family became very powerful. The young girl’s humility dramatically changed the status of her family! But that still doesn’t make it right, I say. Boys and girls played together until their teens. It was probably when those pesky hormones came up that they were separated. When a boy was twenty years old, his hair was ceremoniously pinned up under a cap. But a girl was considered an adult at the age of fifteen, and that’s when there would also be a ceremony to pin up her hair. Phew. If my family were living in Ancient China, I’m pretty sure it would be horrible for me, since I’m a girl and all. But I suppose in those days the girls were brought up as inferiors from the time they were born were probably used to it. The world certainly has changed, what with more women’s rights now. Also not to mention that with the internet, everyone is equal and is heard. Ancient China is very fascinating, but I think I much prefer my modern world. Our environment works like a food chain. Let’s say, on an island, there are wolves (carnivores; meat-eaters; predators) and rabbits (herbivores; plant-eaters; prey) and plants. The plants need water and sunlight to grow, the rabbits eat the plants, and the wolves survive on the rabbits. If we took away the wolves, then the Rabbits would over populate, and the plants would quickly die out, leaving the Rabbits to starve to death. When we say that an animal is endangered, it means that the animal is in danger of extinction. There are certain animals that cannot live in a habitat other then their natural one. For example, the spotted owl can only live in very old, temperate forests with large trees. As those trees get cleared away each day to make way for new buildings and housing developments, the spotted owls will find it hard to survive. If these displaced animals are unable to adapt to new habitats, they will become extinct which will greatly harm the environment. Examples of two endangered animals are the Madagascar Fish Eagle (Haliaeetus Vociferoides) and the Florida Panther – both critically endangered. In a true example that everything is connected, the lack of rice in recent times has encouraged the creation of more rice-paddy fields. In Madagascar, the development of wetland areas for rice-paddies has disrupted the breeding areas of the Madagascar Fish Eagle, in addition to eroding the soil and contributing to deforestation. The Madagascar Fish Eagle, true to its name, feeds mainly on fish. But despite the fact that it is a predator to fish, it is actually also itself a prey. In fact, it is one of the rarest preys, and the largest raptor in Madagascar. A raptor is a bird of prey, a type of bird often characterized by a hooked beak, sharp talons, and keen eyesight.. 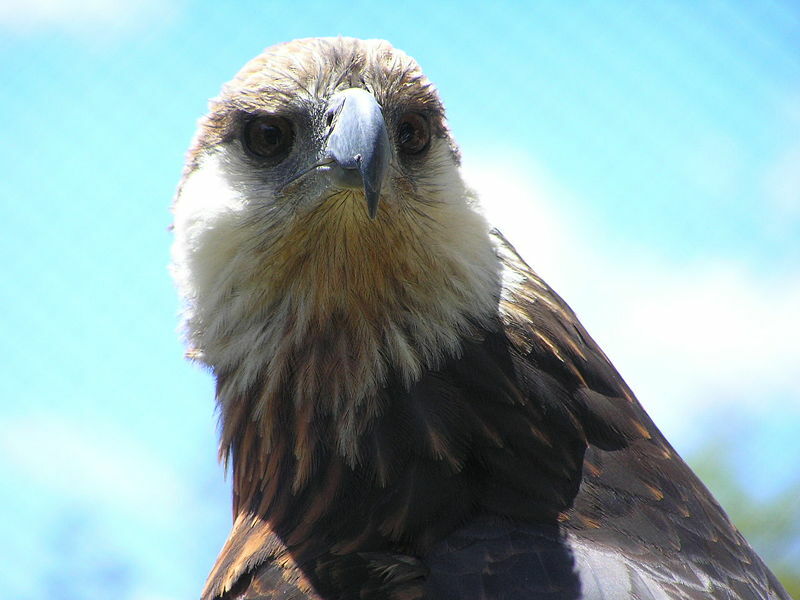 The Madagascar Fish Eagle breeds from May to October. But its breeding rate is just 0.15% per territory, which explains its rareness. The status of population of this bird in 1995 comprises at least 222 individuals (adults and juveniles) and includes 63 known breeding pairs. When I was doing research on the Madagascar Fish Eagle, I found a website with many facts about this bird. The first one was easy enough to understand: Kingdom: Animalia. But the rest… Chordata, Aves, Falconiformes?! I guess bird watchers/lovers have a language of their own. 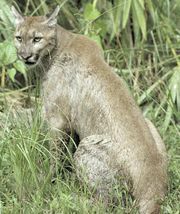 It is breeding season for the Florida Panther from December to February. This panther is losing its habitat and is critically endangered because of human development, population growth, collision with vehicles, parasites, feline distemper, feline alicivirus (an upper respiratory infection), and other diseases. It is a pretty well known endangered animal. I say well known, because the Mayor of Florida has declared March 15th as “Save the Panther” day. That’s pretty well known. At least, for the Floridians. I didn’t know about that until I googled “Florida Panther”. There is even a specialty Florida Panther license plate! And a few entire websites devoted to the Florida Panther made by the Floridians that are full of information on the Florida Panther, its natural habitat, and loads more. Notice I said a few websites? Yes, whereas, the Madagascar Fish Eagle, has websites containing information on it, yes, but no full websites on just the Madagascar Fish Eagle. Which, I find interesting. Perhaps the Madagascarians don’t have internet access, or they are simply not aware. I don’t know. Because here you have two critically endangered animals, but one of them so much more known because it’s from one of the most advanced countries in the world. Which is why, I am asking you to spread awareness to others, because you too, can help save the Florida Panther, the Madagascar Fish Eagle and other endangered animals, and bit by bit, save the world. The old Melaka in Malaysia was a very important place. It was one of the main trading ports of Malaysia, traders from China would often come and trade their silk. Traders from India and Arabia would also come. Melaka helped to shape Malaysia as it is today. And so this story is about the man who made it all happen. Paramesvara ruled as a prince in Pelambang, Indonesia, where he was born. Pelambang had a river running near it, called the Melayu river. The people who lived in Pelambang were called Malays after the river Melayu. Prince Paramesvara was very proud because he got married to the King of Majaphit’s daughter, Permaisuri. That was rather typical of people from the 1300s. Ever wonder if he loved her for who she was, not who she was born as? Or vice-versa? Anyway, even though Paramesvara was a descendent of a magical prince, his new wife’s father, the king, was his overlord. Paramesvara was not happy with that, since he too was once an overlord of Srivijaya – a great empire that sold tortoise shells and beeswax. Tortoise shells and beeswax, though? Not so great, in my opinion. All the poor tortoises. Paramesvara, having tasted power once, naturally wanted to be overlord again. For him, being a vassal was not satisfying enough. So Paramesvara wrote a letter to the King of Majaphit, telling him that he would not take orders from him because it rather hurt his ego. The King was furious. If Paramesvara didn’t want to obey him, the other kings might think he was a weakling. And that wouldn’t do well for his ego either. And so, the King attacked Paramesvara. But Paramesvara, Permaisuri, Paramesvara’s Malay noblemen (what happened to their familys?) and thirty sea gypsies had seen the King’s soldiers coming from the river and fled to Bintan. Many sea gypsies lived in Bintan. The sea gypsies there attacked and stole from the ships that passed – kind of like pirates. Paramesvara wanted to become a pirate but his wife, Permaisuri, was aghast that her husband would do such a thing. But, as Paramesvara reasoned, they needed to survive and to eat. Permaisuri, however, was ashamed. She had married a prince, not a pirate after all, she rather snootily told him. But Paramesvara was determined, and anyway, he said, they would have had to pay him taxes if he still had a kingdom. Sadly, after a few months, Permaisuri became very ill and died. Paramesvara was very sad. He regretted ever becoming a pirate. Living in Bintan reminded him of his wife’s death andhe had to move again. Paramesvara and his men sailed away from Bintan Island and soon they came to the island called Temasek. He immediately liked it and declared to his men that this would be his new kingdom. Unfortunately, there were already inhabitants there. Tamagotchi Tamagi, the leader, ruled as a vassal under the King of Ayudhya. Ayudhya is a province in Thailand, which was formerly known as Siam. But Paramesvara obnoxiously told Tamagi that it was cool. He, Paramesvara, would be king and Tamagi would rule under him. Oooh, on hearing that, Tamagi got madder than he already was and drew his sword. Paramesvara followed suit. Paramesvara’s men outnumbered Tamagi’s, and soon dead men covered the ground like the first winter’s snow. Paramesvara did not think that killing was a good start to building a kingdom, but whaddaya gonna do? His men got started on building a palace and Paramesvara went hunting for food. Killing takes up energy, you know. Then one day, he saw a three-coloured lion. He thought that is was awfully weird. But he liked what he saw and thought that it must be a Singa, which means lion in Malay, from the Hindu legends. Seeing as he wasn’t too great with names, he decided to name his new kingdom Singa, after the lion. And so was Singapore born. In Malay, pura means city. So duh, Singa = lion. Pura = city. Singa + pura = Singapura, known in the English language as Singapore. But unfortunately for Paramesvara, he didn’t know that Tamagi’s brother was the King of Patani, a kingdom in the far north. When the King of Patani found out that his brother had been killed by Paramesvara, he wasn’t happy. He asked his overlord, also the King of Ayudhya for ships and warriors, and set off for Singapore. Paramesvara fought back, but there were just too many of them. Once again, Paramesvara fled. This time, to Johor. Paramesvara ruled Singapore for five years, until the brother of the guy he killed to take over Singapore attacked him and he had to flee yet again. He and a thousand of his men fled to Johor, just north of Singapore on the Malay peninsula. They stayed there until large monitor lizards attacked them during the night and they fled once more. A week later, tired of running and wanting to rest, Paramesvara arrived at the Muar river. When he and his men were all rested up, they went into the jungle to hunt. They would be gone for days at a time, but in order that they did not get lost, and hopefully also not run into anymore monitor lizards, they always followed the sea. Then one day, Paramesvara’s dog, whose name we do not know, saw a mousedeer and instinctively started to chase it. But instead of running away, the mousedeer kicked the dog with no name. I know what you’re thinking, poor doggy, but Paramesvara didn’t pay attention to that. Realising that even the mousedeers in these parts were full of fight, the man who was also full of fight decided to stay where he was and to establish his kingdom there. Since he was standing under a Melaka tree, he spontaneously declared the land Melaka, their new home and kingdom of which he would rule. Paramesvara was born in 1344. He founded Melaka around 1402 and died in 1414 at 70 years of age. His kingdom is forever remembered. The very first Alex Rider book that I read was a behind-the-scenes one about how they made the movie. 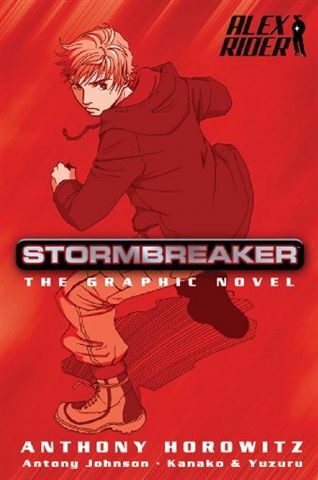 The second Alex Rider book I read was the graphic novel. 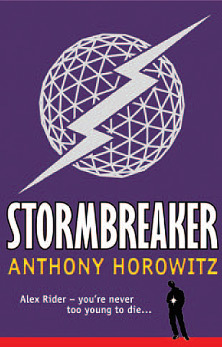 After reading those two, I very much wanted to read the first book in the Alex Rider series, Stormbreaker. The only thing that was stopping me was… my brother. He was already reading the book, and he was taking an awful long time. But that was okay, because I wasn’t very “in” to it yet. It was cool. I was like, “whatever, take your time”. Until, you know, I caved and read the book while he was still reading it. He was not amused when his bookmark accidentally fell out while I was reading. Anyway, once I read the book, I fell for it hook, line and sinker. About 70 per cent of books in general are made up of description, while the other 30 per cent is usually the storyline. That was my dad’s “excuse” when explaining to my indignant brother why he had skipped so much – he really just wanted to know the storyline. But it’s true. Anthony Horowitz manages to write in a way that mesmerizes the reader, and you cannot put the book down. It’s only until you bang into a piece of furniture while walking and reading at the same time, because you can’t put it down, that you know it’s a very good book. While you may think that Alex Rider is for boys, which I did because duh, a teenaged boy that saves the world, it is in fact suitable for girls too. However, one might wonder why a girl would read it when the only females on the “good side” are Mrs. Jones, the head of Special Operations division in the MI6 and Jack Starbright. Jack takes care of Alex from the time his uncle, who is, by the way, MI6’s best agent, dies. Neither of these two females are kids or teenagers. Although Jack is pretty much like a kid sometimes. But does that even matter? For the girl who somehow picks it up, she will be hooked on it, and then in Skeleton Key, the third book in the series, Sabina Pleasure comes into the picture. I have to admit, I absolutely loved that. And I am happy to report that Sabina and Alex kissed. Twice! But until Sabina comes back in Snakehead, currently the last book in the series, I’m not going to be able to put down Ark Angel, so the furniture had better watch out.